With a few exceptions all our trips are accompanied by one of our experienced Dutch tourguides. All our tourguides speak English. Most likely you’ll have one of the following guides on your trip. In 1991 Marco started to travel as a regular backpacker. He made a one-year journey through America, Australia and Southeast Asia. After returning to The Netherlands he started working as a tourguide for Koning Aap Travel, a Dutch adventure tour company. For eight years, he guided dozens of tours in many different countries on almost all continents. During his private time he traveled the entire Asian continent, but most of all Southeast Asia. Vietnam was the country he liked most. By motorbike he explored the remote mountain areas of northern Vietnam, where you still can find many different mountain tribes, still living according their traditional customs. He also learned to speak Vietnamese. To share his enthusiasm and knowledge of the area, he organized in the year 2000 his first Motor Trails motorbike tour through this beautiful area of North Vietnam. During the first years of Motor Trails Marco guided most of the tours himself. As the number of destinations and tours increased Marco shifted his focus more towards organization and development. But he still likes to guide several trips a year. On her 19th, Lidwien already travelled through the Sahara on motorbike and visited most countries in West Africa. After her African adventure she traveled through Australia, New Zealand and visited many countries in Asia. But again, she returned to Africa where she lost her heart to its nature, music and the African people. As a tourguide she worked for the Dutch travel agencies Koning Aap and Ashraf, guiding tour through mostly Central and South America and Northern Africa. Lidwien currently lives in Germany..
Lidwien started to work for Motor Trails in 2007. Her first tour as a tourguide was our Motorbike Safari in Tanzania. Due to her extensive travel and tourguide experience and her language skills, she accompanied many different tours in different countries for Motor Trails. After Bart graduated in Wageningen, The Netherlands, in the field of Tropical Plant Breeding, he left for Indonesia in 1980, where he worked for several years as a relief worker in Aceh Tengah, a remote mountain area in Northern Sumatra. Riding a motorbike, many times off-road, was a necessity in order to explore the area. After Indonesia, during his 2 year stay in Australia, he travelled across the country on a Honda CB250 for 7 months, covering more than 25,000 kms. After Australia he also explored New Zealand on motorbike for three months. Back in the Netherlands he started working for Baobab Travel. For sixteen years he worked as a tourguide in many different countries. He also organised new tours in South East Asia and in South America. Bart started working for Motor Trails in 2005, first as a tour guide, but nowadays also as part-time tour operator at the office. Bart speaks fluent Spanish and Indonesian. In 2001, Tiziana left the Netherlands for a long journey through Southeast Asia. At the end of this journey she purchased a classic Royal Enfield motorbike in Nepal and drove back home via Northern India, Pakistan and Iran. She fell in love with the Indian Himalayas and often returned there riding a Royal Enfield through this majestic landscape..
Back in The Netherlands she gave up her regular job, traveled around the world, and worked for various international travel agencies. In recent years, she has guided many motorcycle tours in India and Nepal. Since 2008 she works part-time for Motor Trails for which she guided different motorcycle tours in Asia and South America. Interested in the Indian history and culture, Lars made long journeys through western US and Central America. He travelled for another year in South America and ended in Peru where he fell in love with this country. He learned Spanish and married a Peruvian. Living in Peru he guides many trips for several Dutch travel agencies from his new home. Due to his extensive knowledge of the country, the language and the routes, he is the ideal guide to our motorbike tours through South America. Lars has bought his own motorbikes which are used for our South American tours. For Motor Trails he guides our tours in Peru, Bolivia and lately also our impressive tour through Patagonia. At home, Geert's attic is filled with trophies he has won in during the many motocross contests he participated in. During his free time he was frequently found in Cyprus, exploring off-road tracks with his motorbike. 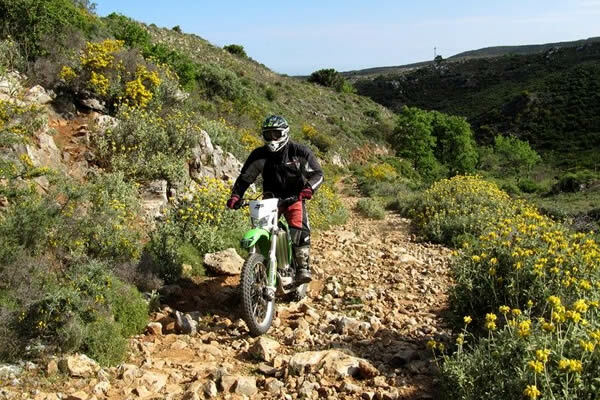 His knowledge of the most beautiful routes and tracks on the island makes him the ideal guide for our off-road Cyprus trail tours. Geert tries to get rid of some of his trophies: during our tours on Cyprus, the person who is the best motorbike rider and does not fall off his bike, and is also the merry-maker of the group gets one of his trophies awarded. However, it does not create any space in his attic, as he still wins new trophies. Remco studied business economics at the University of Amsterdam and worked for a number of years in business. When he worked as a management consultant in Uganda in 2002 and 2003, he became addicted to riding a motorbike in this beautiful country and surrounding countries. During that time he spend about 20,000 km on a 125cc Susuki through East Africa. Since then, he has combined his permanent work with travel and travel. For the Dutch travel agency Sawadee, he worked as a tourguide in Africa, but also in the Middle East and Asia. In 2009 he traveled through Latin America for six months on a Honda 650XR, after which he started working as a tourguide for Motor Trails. After her study industrial design, Maaike worked as a teacher in mathematics as well as a designer. At the office of Motor Trails she uses her designer skills for the lay-out of the guidebooks for our clients and in assisting in the lay-out of the website of Motor Trails. Maaike is also responsible for the hotel bookings and financial administration. Maaike does have a motorcycle license but she prefers the bicycle. For over 30 years Marc made and presented radio programs for different Dutch radio stations, which often includes programs concerning specific types of music. The most famous programs were: "Leidsekade Live” and "Het Theater van het Sentiment”. The USA and the history of American music is another passion of him. Since 1980 he has been visiting the US several times a year. Music, the US and his new passion… the motorbike… come perfectly together in the unique motorbike tour, "The Roots of Music”, developed by him. Riding a Harley on virtually abandoned roads through The Deep South of The Mississippi Delta, with your speakers on full blast, remains a great experience. In addition to traveling, Marc is still active as a radio presenter, he further gives lectures on the history of American music, and also wrote a book about this subject. Since 1979 Roel has been a motorcycle instructor. In his own free time off-road bikeriding has been Roel's biggest hobby. He also participated in motorcross competitions, inspired by the successes of his father-in-law Frits Selling. Ten years ago he started combining this passion and his career as driving instructor by organising courses off-road riding for enthusiast bike riders. For Motor Trails Roel guides our off-road trail tours in Turkey and Morocco. When needed, he will give you the best advice concerning the technique of off-road riding. Robert likes various sports such as sailing, mountain biking and of course motorbike riding! He already made many bike tours through different countries. Especially in Africa, he has acquired extensive knowledge of the different cultures and the road conditions. After many years of exploring he still discovers new tracks through Tanzania and beyond. He loves the rugged nature of East Africa, and as a tourguide for Motor Trails enjoys to show the participants the natural beauty and the local culture of his favourite continent. Because of his cultural knowledge, he makes easy contact with the population. In the Netherlands Ko rides a big Moto Guzzi. However, when he first arrived in Kenya in 2011 he started riding off-road, for which he used, for the first time, a small and light motorcycle. He fell in love with this continent and continued exploring the continent, always using a small motorbike for easy off-road riding. Ko traveled from Kenya to Cape Town in 2017 on a 200 cc. But before that he already made countless smaller trips through East Africa. Every year he goes to the African continent for 3 months to further explore this continent, and to guide our motorbike tours. Ko knows a lot about cartography and computers, but is now also very skilled in motorcycle-maintenance. Since the end of the last century, Jan has traveled to Africa regularly. He settled in Tanzania and runs the Sawa Sawa Beachhouse on the coast of this country. With his son Ivo he developed the first Motor safaris in East and Southern Africa. 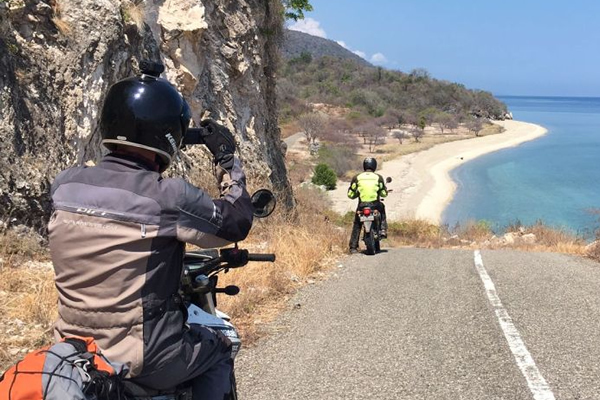 "Motorcycling in Africa is a wonderful way of traveling, everywhere you are welcome, it's all relaxed and very beautiful"
After travelling to Indionesia several times Roland fell in love with this country. In 2007 he moved to Indonesia to live there permanently. After exploring various islands by motorbike, such as Java, Bali, Lombok, Sumbawa and Flores, he decided to make a living out of his passion by organising motorbike tours through various parts of Indonesia. Since 2011 Roland has been developing and guiding new motorcycle tours not only in Indonesia, but also in Thailand and Philippines. From 2017 he works as a tourguide for Motor Trails in Indonesia and Philippines. Roland speaks fluent Indonesian. Vincent was only eight years old when he first stepped on a cross motorbike. It was the beginning of his motor career. Now, many years and many kilometers later, he still does what he likes to do every day: riding a motorcycle. As "The Motorbiketrainer", Vincent gives motorbike training in Amsterdam. In addition, he works as a specialist for various organizations like Trackdays4All, Motor Speed and Racecracks. He gives training weekends in Germany and motorbike-circuit days in the Spanish Alcarràs. For Motor Trails, Vincent takes participants to Morocco for an unforgettable off-road experience in the impressive Atlas Mountains.